Broken Gable. A gable roofed-structure with sheds or lean-tos added on both sides to the eaves of the gable to form a ‘broken’ slope. 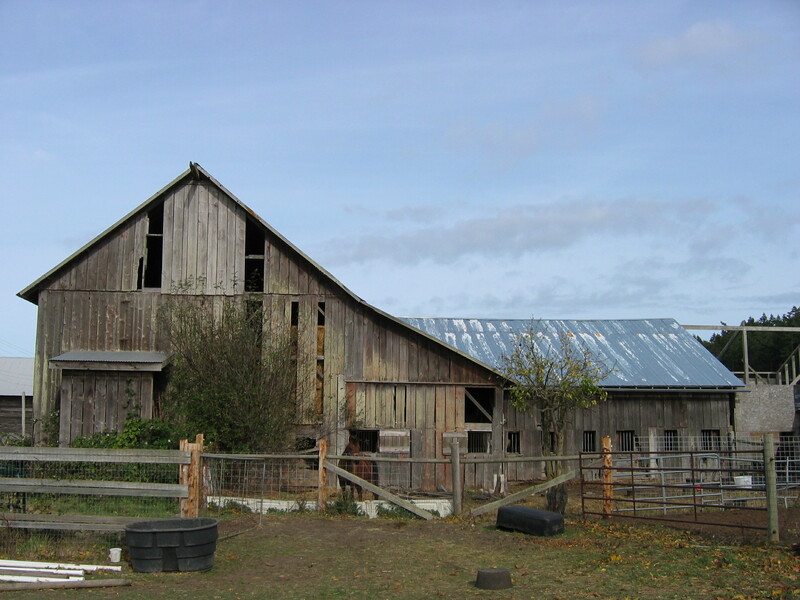 Barnswallow Farm, Beaverton Valley, San Juan Island. Originally homesteaded by William Higgins, this place eventually was farmed by Harold Guard, with a dairy operation that included most of Beaverton Valley. 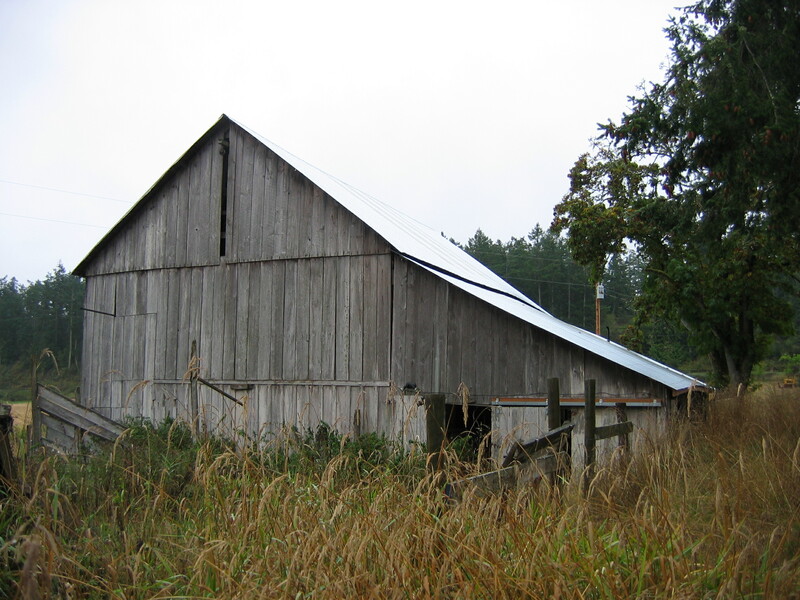 Oriented north-south, the barn has a broken gable roof, is 47’6″ wide by 50’6″ long and 33′ high, with a 17’6″ by 20′ shed on the east. The central space was a floor-to-ridge hay mow, with a milking parlor with manure gutter to the west side. It is listed on the Washington Heritage Barn Register. J. O. Bergman Farm Barn, Argyle, San Juan Island. Originally built around 1905 on the J. O. Bergman Farm further to the south, this barn was moved across the field around 1920. Currently oriented north-south, it has a main gable-roofed area measuring 17’6″ wide by 30′ long and 19’6″ high, with a loft. To the northwest is a 17’3′-wide by 19’6″-long shed, which has evidence of whitewash, indicating that it had been used for dairying. The structure is milled frame construction. On the original farm property to the south is a house, garage, storage shed, and water tower. Hans Christensen Barn, Shaw Island. 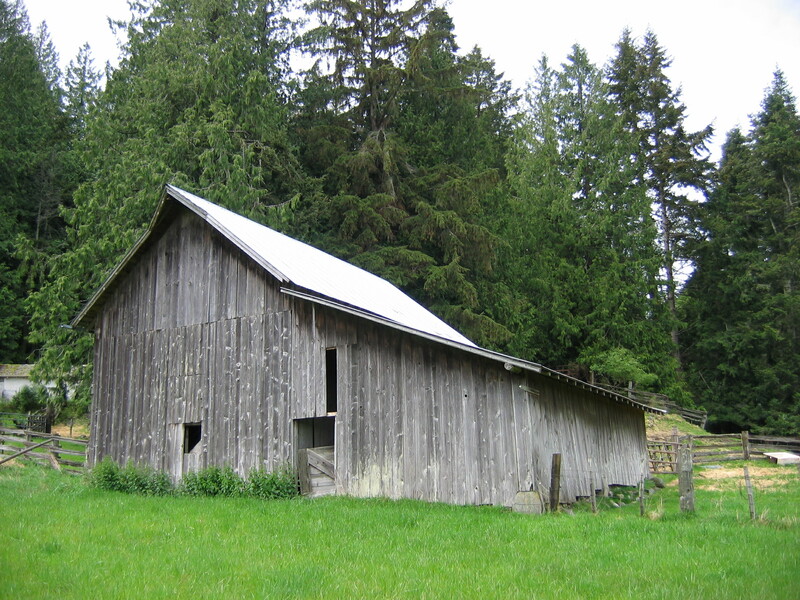 This barn, which has many unique aspects, is almost a cross between an English barn and a Coast Salish longhouse. Hans Christensen may have obtained the property from a French Canadian who was married to a Sooke Indian and employed by the Hudson’s Bay Company as a deer hunter. It is constructed with timber frame, featuring a king post with braces, and clad with vertical riven cedar wood siding secured with hand-wrought nails. The plan is center drive, with a hay mow on one side and what may have been a threshing floor on the other. 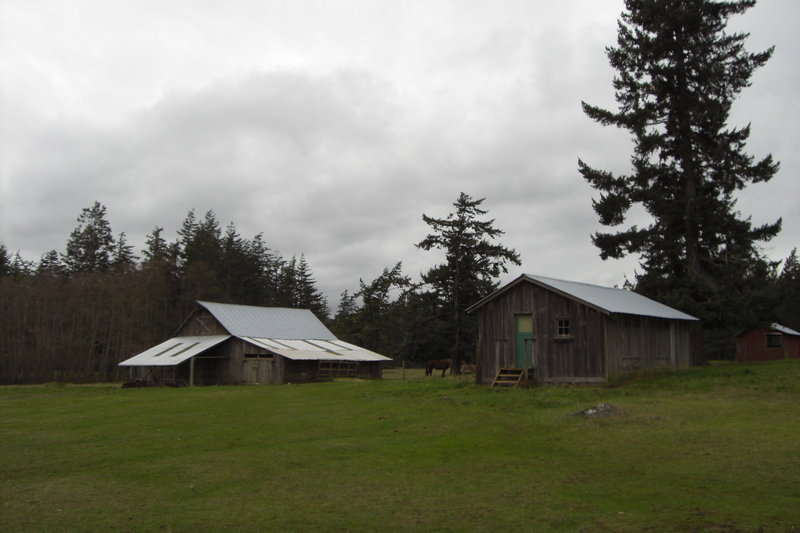 Coffelt Farm Barn, Crow Valley, Orcas Island. 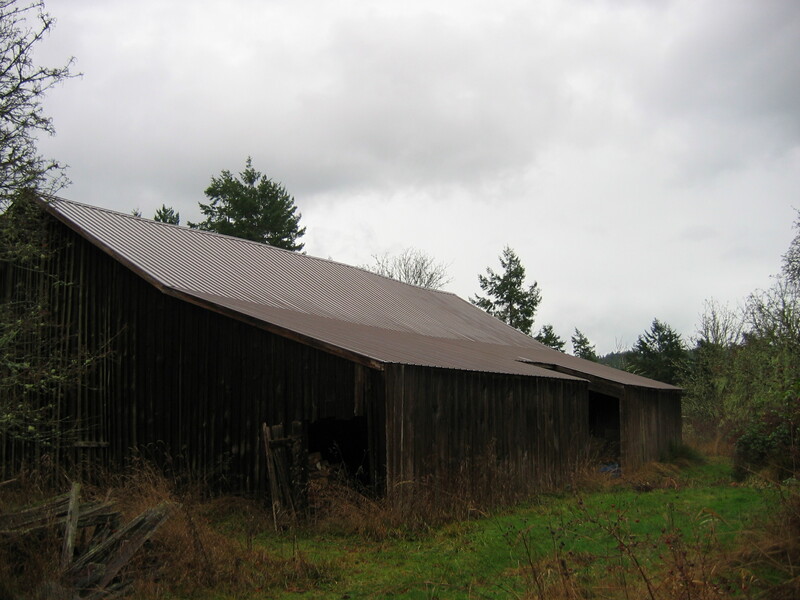 Relatively new (1950s) and designed as a sheep barn, this structure consists of a main gable with flanking sheds. It is built with log posts in the ground, log beams, and frame side walls and roof. A single story structure, it measures 38’10” wide by 32′ long and is 15′ high. James Cousins Farm Barn, Lopez Island. James Cousins and his family homesteaded this place in 1883, ultimately building a house, barn, root cellar, milk house, and machine shed. The timber-frame barn, which has a gable roof with shed covering a center drive, measures 30′ wide by 60′ long; another 18′-wide shed contains the milking area with stanchions, mangers, and manure gutter. The barn is 35’3″ high and apparently they did not use a hay rail and trolley system to fill the hay mows on either side of the drive in the gable portion. The broken gable shed contained stanchions on one side and stalls on the other. Decatur Log Barn, Decatur Island. This simple broken-gable roofed structure consists of a central gable section constructed of peeled, unhewn logs and two flanking wood frame sheds. Joe Ender Farm Barn, Lopez Island. Joe Ender had a farm with several structures: a Dutch Revival house that he moved from Lopez Hill and a barn, milk house, root cellar, and workshop. The barn has a gable roof with a shed added along the side. The main portion under the gable measures 30’8″ wide by 74’4″ long; the lower shed is 20′ deep. The center access drive, flanked by hay mows, of the main gable portion is 31’2″ high; the shed contained stanchions for milking cows, with the milk being taken to the adjoining milk house for separation and cooling. Englehartson Barn, Orcas Island. 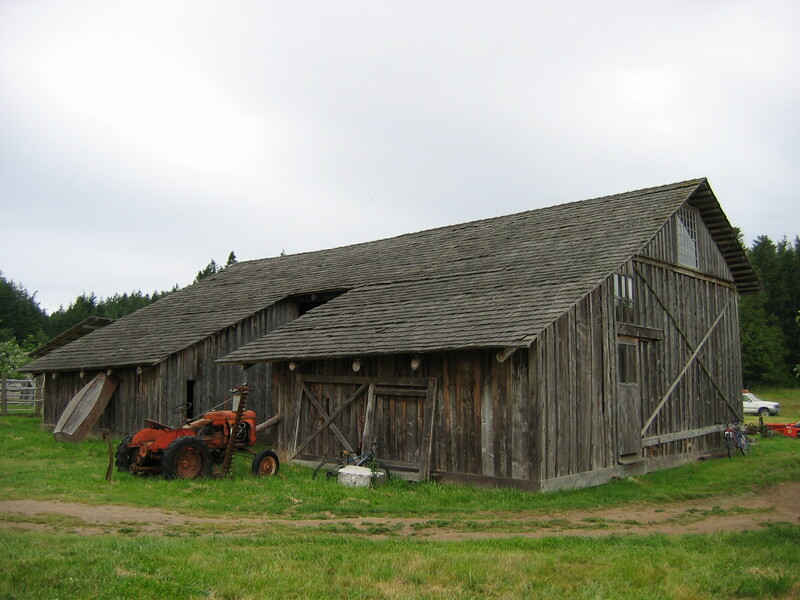 This barn is a four bay timber frame structure oriented east-west with a shed on the north side. It measures 24′ wide by 36′ long, with the shed adding another 20′, and is 26′ high. Under the gable is the hay mow, which is accessed with a hay door and hood, and has a steel track and trolley. There is a partial loft in the mow, and the shed was used for milking stanchions. Guard Farm Barn, Beaverton Valley, San Juan Island. The Guard family had several farms on the west end of Beaverton Valley, where they raised oats and rain dairy cattle. The barn is part of a larger farm complex that includes a house, granary, and old log cabin that was later used as a root cellar. 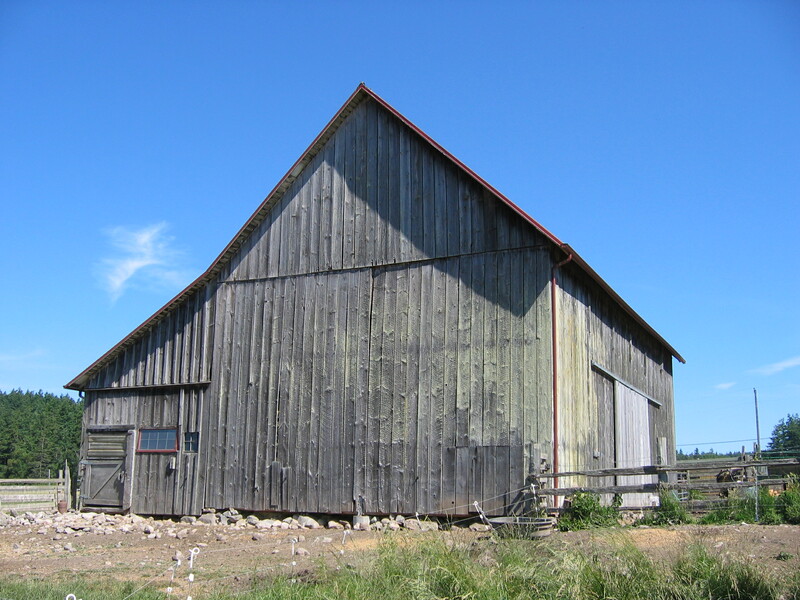 Oriented east-west, the structure consists of a 26′-wide by 41′-long lofted space with a 17′-wide shed on the north side that was used for milking. The hay door in the west gable slides vertically, and there is a hay rail and trolley system in the loft. The milking shed, which is whitewashed, contains some remnants of stanchions. 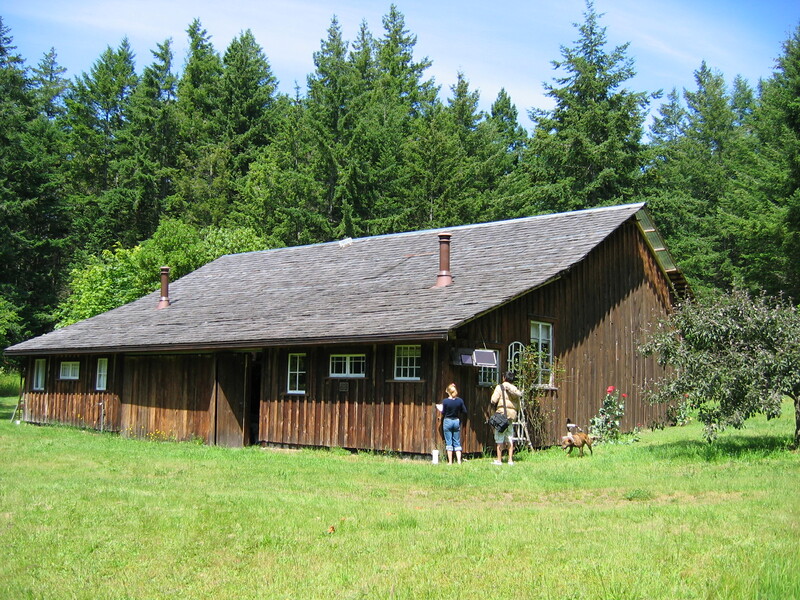 Samuel Hinton Farmstead, Lopez Island. Originally farmed by Samuel Hinton, this place was later used by George Gallanger. Constructed with log posts and both pole and milled beams and braces, the main section of the barn under the gable measures 22′ wide by 25′ long and is 24’2″ high; the shed forming the broken gable is 13’6″ wide. There is a hay door with hood on the south gable, suggesting that the main portion was used as a mow for loose hay. 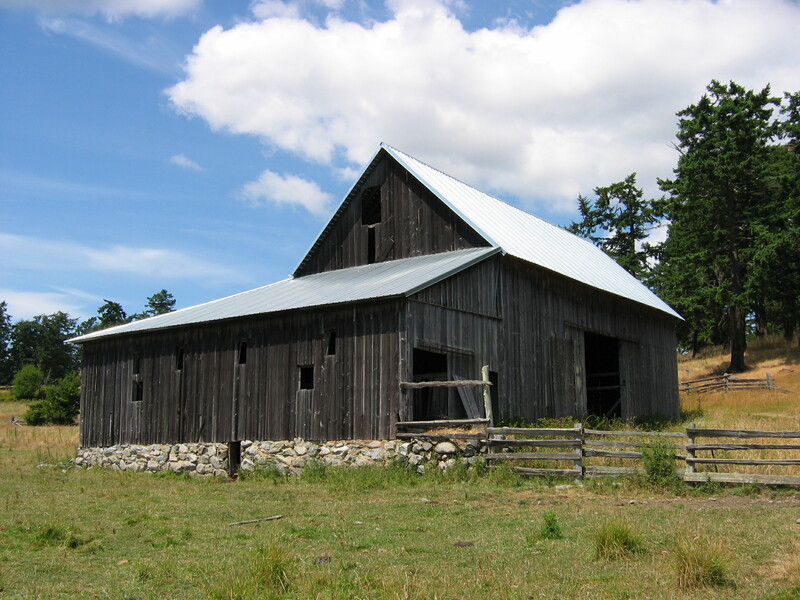 Norman Hodgson Barn, Lopez Island. 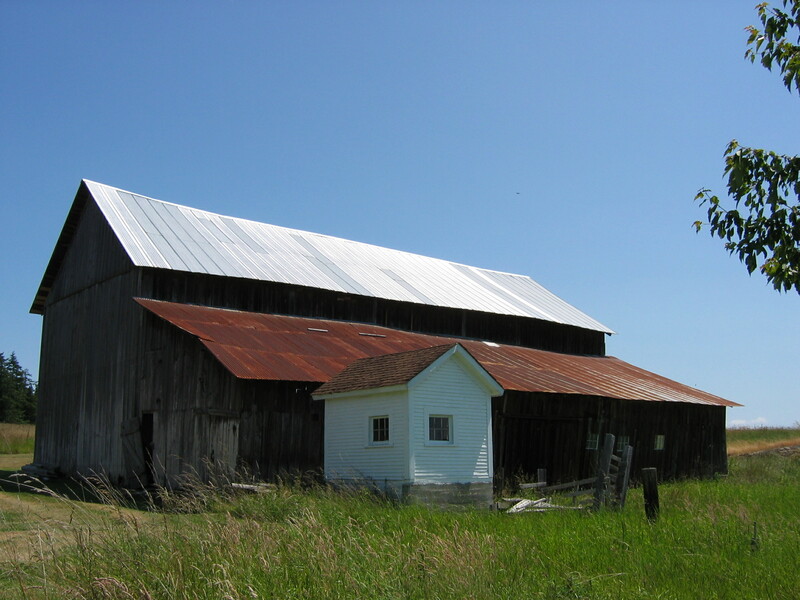 Norman Hodgson was a prominent member of the Richardson community, and this barn may have been one of several located on his farm. It is approximately 74′ wide and 32′ deep, and consists of a 32′-square center section with loft flanked by 20′ sheds. At its peak it is about 26′ high. According to tradition the center portion was moved from a nearby site prior to 1900; later the two side sheds and a back shed (since removed) were added in the early 1900s. The center portion, which has a concrete foundation and floor, functioned as a granary. Chris Jensen Farm Barn, Lopez Island. The Chris Jensen farmstead consists of several buildings, including a house, barn, chicken house, milk house, machine shed, root cellar, and smoke house. 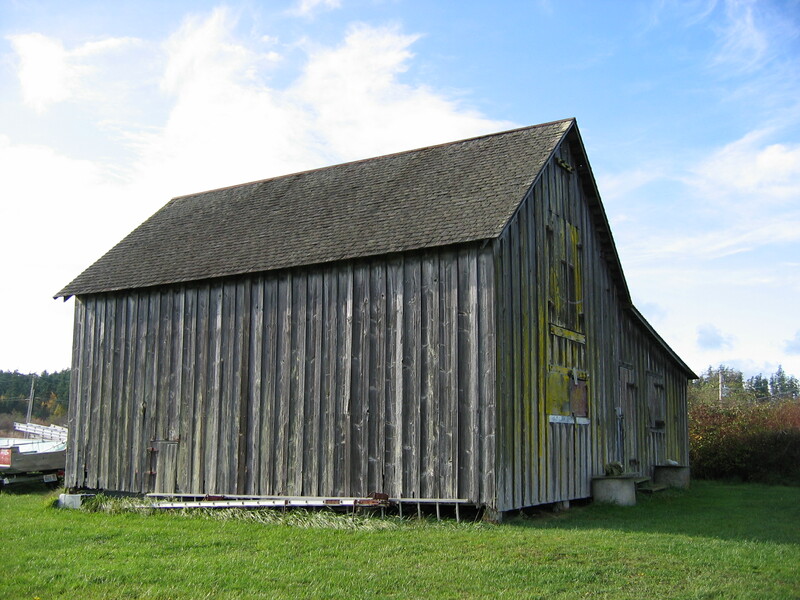 The main gable of the barn is 30′ wide by 40′ long, with an 18’6″-wide shed on each side forming the broken gable. 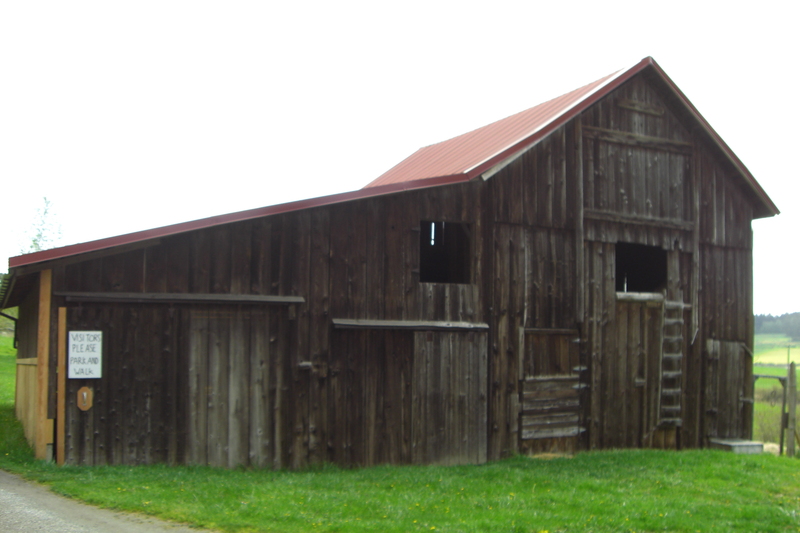 A timber frame structure, the center portion was used as a loose hay mow and the sheds were probably used for stanchions and equipment storage. James Jorgensen Barn, Orcas Island. Danish immigrant James Jorgensen homesteaded this place in 1883 and the barn was probably built around 1890. The broken gable-roofed structure measures 42′ wide by 53′ long, and is 25′ high, with a 20′ by 20′ loafing shed added. The central portion is a floor-to-ridge hay mow, while the adjoining shed features stanchions with a manger and a manure gutter. 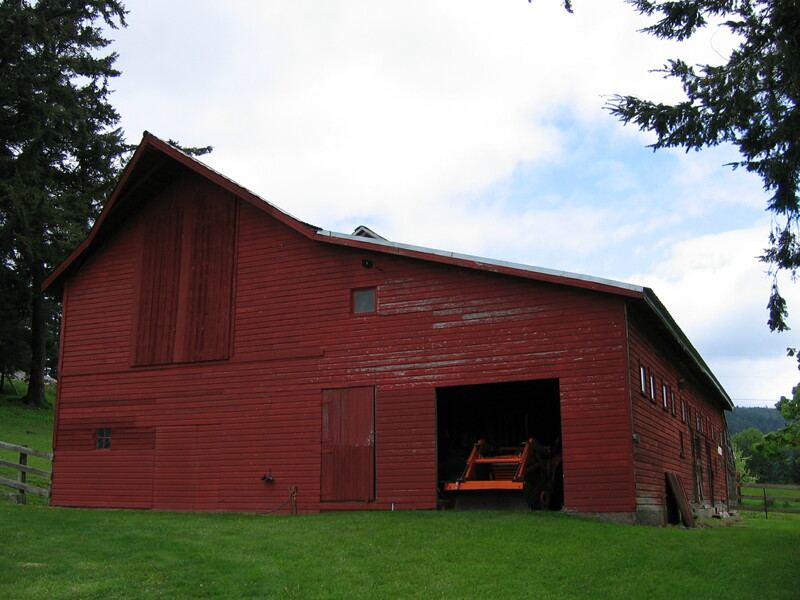 The barn is listed on the Washington Heritage Barn Register. Krumdiack Homestead, Waldron Island. Homesteaded in 1890, the Krumdiack Farm consists of a log house, timber frame barn, and several associated outbuildings. The barn, which measures 42′ wide by 57′ long, has a center drive flanked by two sheds. The log ridge pole rests upon two 20-foot high tree trunks. The Krumdiack Homestead is listed on the National Register of Historic Places. Jim McCauley Barn #1, Lopez Island. 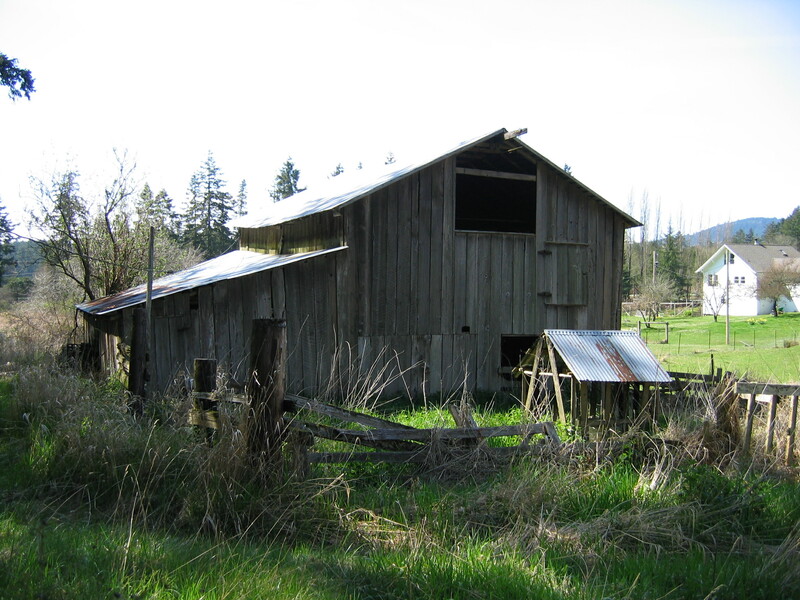 There are two barns on the Jim McCauley Farm; a broken gable-roofed one (#1) and a shed-roofed one (#2). 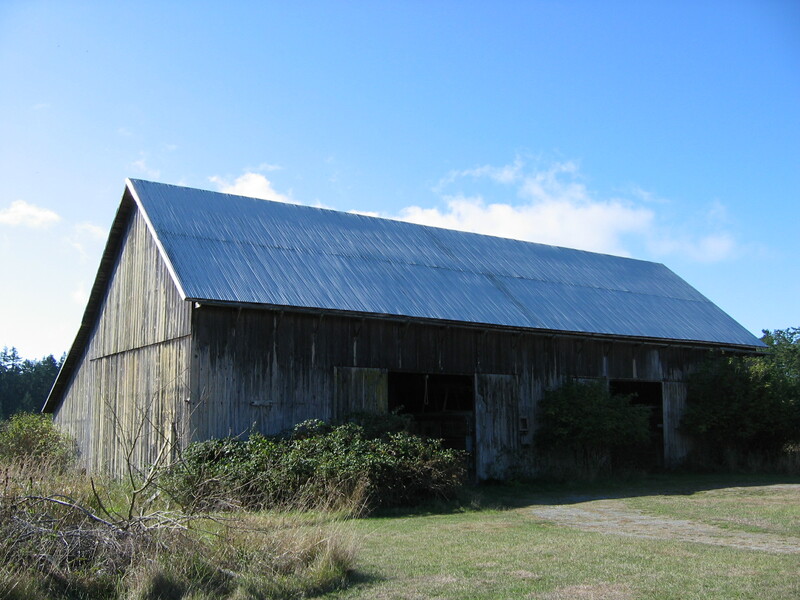 The broken gable-roofed barn (#1) is built with posts and beams on sills, and measures 20′ wide by 26’4″ long with a 22’4″-wide shed. The gable portion , which is 23′ high, has a loft for hay and a white-washed area below, which suggests that it was used for dairying. The vertically-sliding barn door is fairly rare in the islands. Point Hammond Farm Barn, Waldron Island. Point Hammond Farm consists of a farm house, barn, and several associated outbuildings. The barn is timber frame, with a distinctive ‘queen post’ form of bracing. 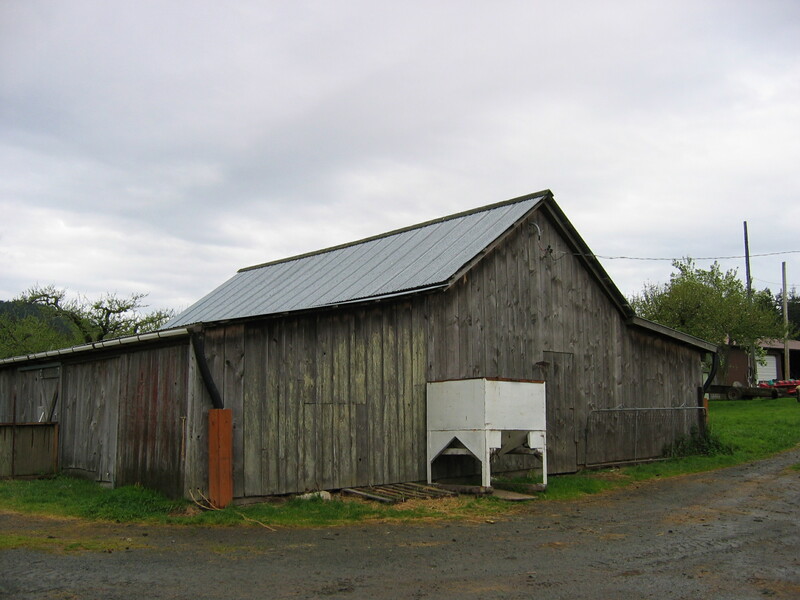 The main gable-roofed section of the barn, which measures 30′ wide by 56′ long, has a center drive, which is flanked by two sheds on the south side. With the predominant winds being from the southeast, it is possible that the center drive was used for winnowing grain. 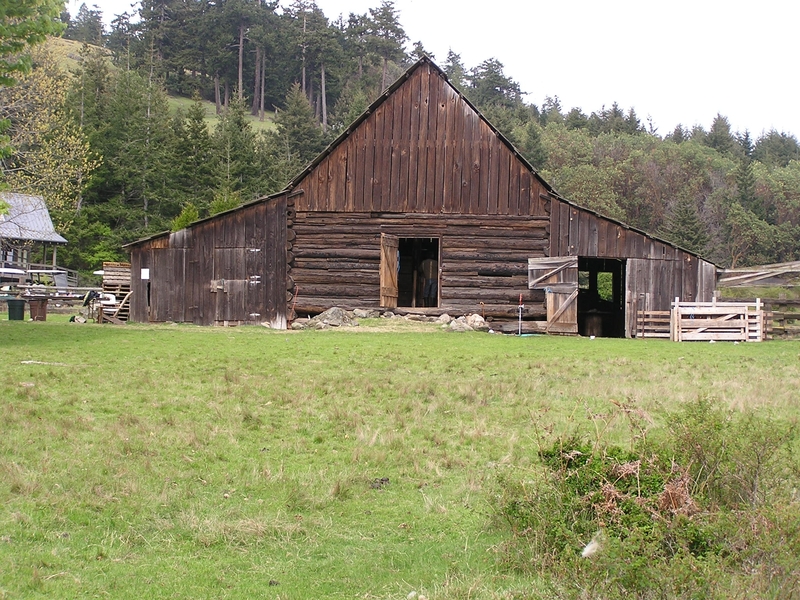 Ab Ridley Barn, Lopez Island. This timber frame structure has a center drive with flanking hay mows under the gable-roofed portion and flanking stalls under the shed that forms the broken gable. It measures 30′ wide by 54′ long with a 15′-wide shed; the height is 35′ to the ridge. Of particular note are the sills resting on field stones. 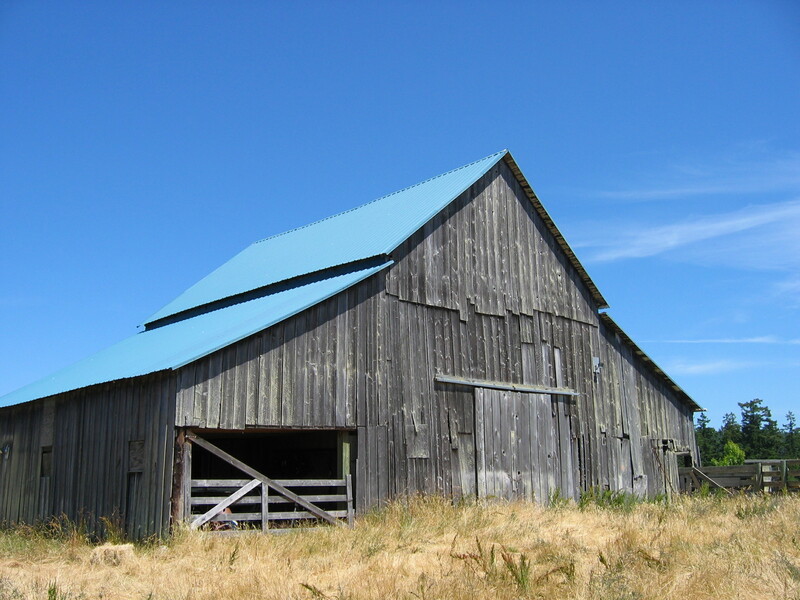 Seifert Barn, Lopez Island. Not much is known about the history of this barn. It consists of a main, gable-roofed area, 24’6″ wide by 48’5″ long and 19’6″ high, that was used as a hay mow, and a 16′-wide shed on the south side that forms the broken gable, which was used for milking. There are remains for 14-15 stanchions as well as mangers, a manure gutter, and a ramp access for the milch cows. 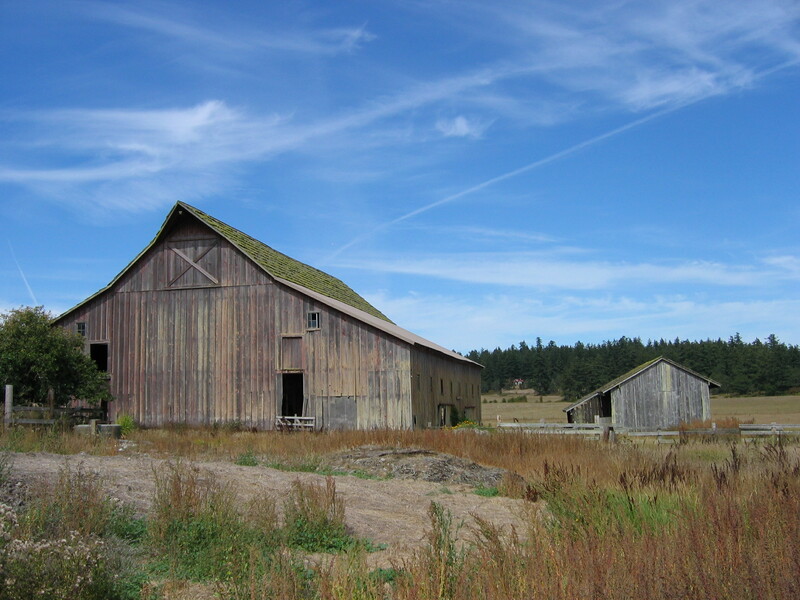 Stanbra Farm Barn, San Juan Island. Oriented north-south, the Stanbra Farm Barn consists of a main gable area for a hay mow and a milking shed addition to the east. The mow measures 24′ wide by 32′ long and 21’8″ high and has a hay door with steel rail and trolley system. The milking shed has at least three stanchions. The structure is log posts with milled beams, braces, and rafters. This barn was built by Peter Gorman before it was owned by the Stanbras. Tharald Homestead Barn, Shaw Island. Built by brothers Theodore and Thomas Tharald ca. 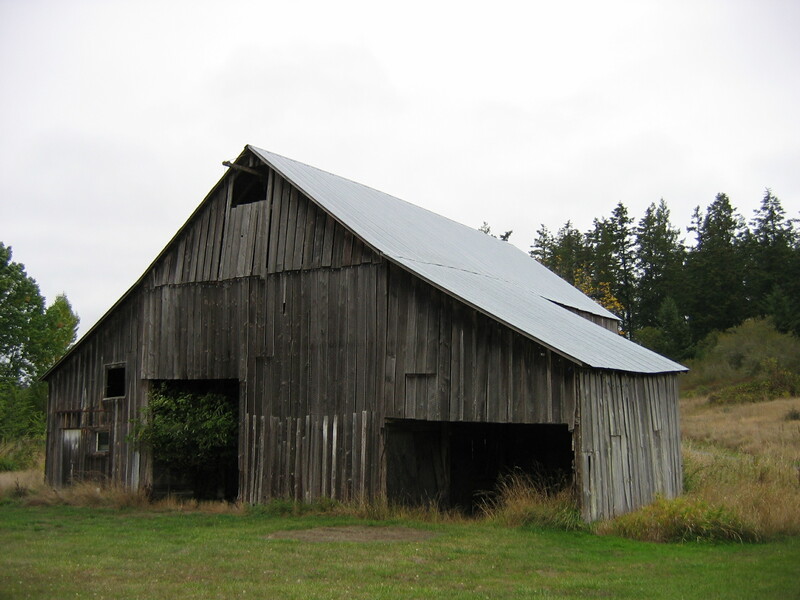 1900, this large barn measures 40′ wide by 62′ long and is 29′ high. It has a large hay mow under the main gable with a hay rail and trolley that is accessed by a fairly rare vertically sliding hay door counterweighted by boxes full of gravel on pulleys. The shed addition on the south functioned as stalls and stanchions for the dairy herd. The structure is log posts and cross beams, while the sides and roof are milled lumber. Valley View Farm, San Juan Valley, San Juan Island. This dairy barn was part of Valley View Farm, bought in 1917 by Roy and Myrtle (Hemphill) Guard from land that was originally homesteaded by Peter Jewell. In 1950, Clyde and Ruth Guard Sundstrom bought the property, and operated a dairy there as well as raising oats, barley, and hay; livestock such as sheep and beef cattle; and poultry such as chickens and turkeys. The barn is 80′ long, 68′ wide, and 36′ tall. It has a broken gable roof—two slopes per side, the upper one being of steeper pitch. 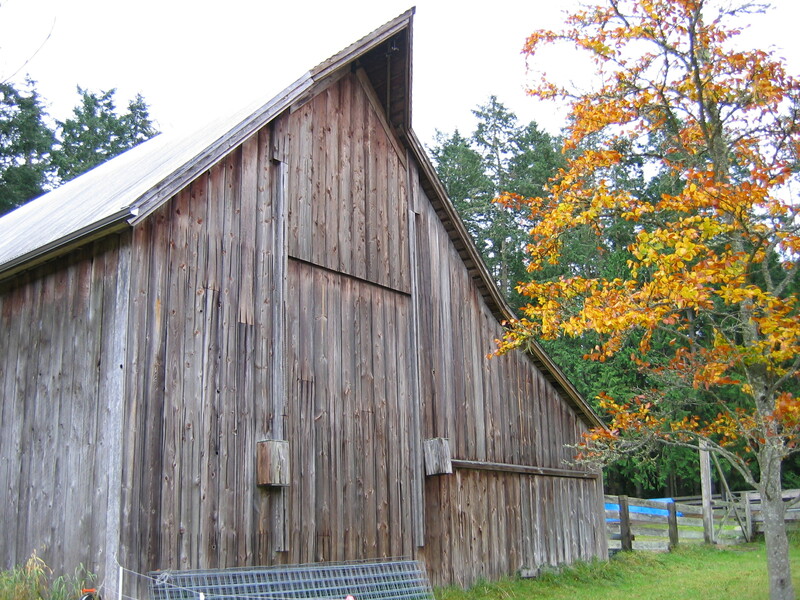 The barn is listed on the Washington Heritage Barn Register. Edson Weeks Barn, Lopez Island. The Edson Weeks barn is singular in that it has a five bay, timber frame ‘bent’ system with two center drives. The structure is large–62′ wide by 100′ long–and tall–38’4″. The main space under the gable roof, which is 40′ wide, contained the hay mows, while the 22′-wide shed that forms the broken gable on the south side contained as many as 22 stations for milking, including mangers, stanchions, and manure gutter. 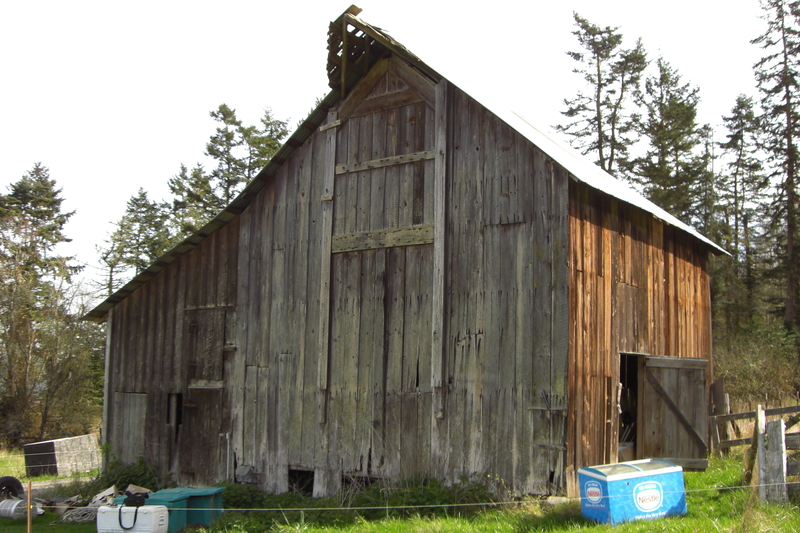 John Wilson Barn, Lopez Island. John Wilson, who came to Lopez from Michigan in 1892, had a 80-acre dairy farm with his father-in-law, George Boulton. The barn has two parts: a 46′-wide by 70′-long, 31’9″-high broken gable roof section used for hay, grain storage, and horse stalls and a 30′-wide by 36′-long addition to the east that contains a ‘modern’ milking parlor, complete with concrete floors and manure gutters and pipe stanchions. There are also a farmhouse and blacksmith shop on the property. E. J. 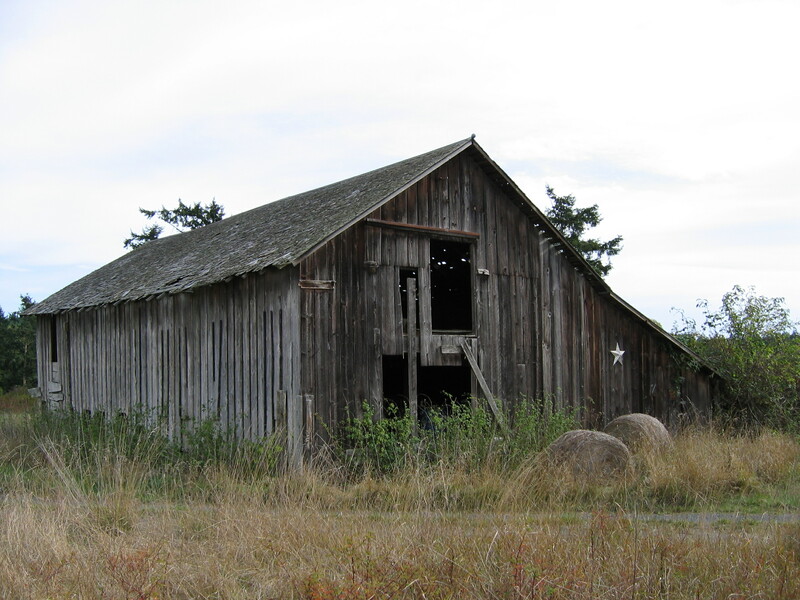 Young Farm Barn, Orcas Island. On land originally homesteaded by John Bowman, Ed J. Young had a farm with this dairy barn as the center. Oriented north-south, it consists of a 25′-tall, central gable-roofed hay mow that measures 44′ wide by 64′ long, with a 14’6″-wide shed on the east that functioned as a milking shed. The hay mow had a track and trolley system that was accessed by means of diagonally sliding hay doors–a feature that is rare in the islands. The barn also had up-to-date features such as an overhead manure trolley on a track that ran the length of the walkway between the mow and the stanchions and exited out the north side. Nearby is a milk house with root cellar below.